We have picked out some of our very best sub-ohm devices to help you make an informed decision. This is where high-end vaporizers begin, and you gain access to more advanced OLED displays and temperature control options. These kits are the next step up for experienced vapers who want something new to play with. When you’re shopping for the vape lover in your life, there are plenty of ways to wow them with a great gift. Because vaping is a unique hobby within an ever-changing, incredibly innovative industry, there’s always a new product to try and enjoy. One of the most enjoyable aspects of vaping is experimenting with new vape devices, e-liquids, and accessories, making it possible for every vaper to customize and create their ideal vape experience from beginning to end. There’s not a vaper out there who wouldn’t be thrilled to open up a brand-new vape product to enhance their daily vape sessions, making nearly any quality vape item a guaranteed slam-dunk gift. Here at VaporFi, we decided to put together a handy shopping guide packed with all the best vape gift ideas in every category. If you’re looking to splurge on a showstopper gift - or just want to treat your special someone to a little vape treat - you’ll find plenty of options in this guide. Using our gift guide, it’s easy to break down your gift options from high-end mods and top-of-the-line rebuildables to premium e-juices and well-made accessories. And don’t blame us if you end up buying a few new things for yourself too - with this many great vape products, it’s pretty impossible to resist. These five high-end vape mods are great for even the most discerning vaper, with each one packing a serious punch when it comes to performance, stylish design, and premium quality. Don’t let the compact size of the VaporFi VOX 60 TC MOD fool you; this pocket-sized device is fueled by a 2600mAh battery and produces up to 60W of pure power. It’s a great mod for vapers who prefer a minimalist design, with a sleek zinc alloy body that’s attractive, durable, and lightweight. The OLED screen displays all the pertinent information at a glance, while the square-shaped firing button adds a stylish geometric touch. It works with both standard and sub-ohm coils, and smart design elements like the auto ohm resistance meter, safety protection suite, temperature control, and a vented battery casing round out this excellent mod. If you’re shopping for a beginning vaper - or even one who just likes to keep things simple - it’s tough to find a better gift than the Eleaf iPower 80W TC Box Mod. This mod manages to achieve the ideal balance of simplicity and performance, providing an incredibly user-friendly vape experience without scrimping on features. With an impressive 5000mAh internal battery, the iPower definitely lives up to its name, offering all of the benefits of an advanced mod without any of the hassle. An attractive aesthetic design (including the option of a classy woodgrain finish), automatic coil sensing, temperature control settings, and variable wattage are among the other excellent features of the Eleaf iPower 80W. Right off the bat, the Tesla Punk 220W stands out from the mod crowd with an eye-catching, steampunk-inspired design. This artistically-crafted mod features customizable light designs and four stunning finish options, including copper, rainbow, and gunmetal. Plus, this vape mod is more than just good looks - it has plenty to show in terms of performance as well. It’s 510 compatibles, making it easy to pair the high-powered mod with just about any quality tank on the market. When it comes to coil options, the mod sticks to its theme of versatility, playing nicely with titanium, nickel, and stainless steel alike. The Fuchai GLO 230W TC mod is a head-turning device from Sigelei, a high-end vape brand that’s earned plenty of respect in the industry. The Fuchai GLO has a creative, stylish design unlike any other mod on the market, pairing a selection of sleek color options with a customizable bottom-base LED that can be easily switched up with the RGB color calibrator. Sigelei’s high-tech chipset takes the Fuchai GLO to the next level of performance, making the most of an advanced temperature control suite, impressively accurate calibrations, and more. With a crystal-clear OLED screen, it’s easy to keep track of precise adjustments to achieve the ultimate in perfect vapes. As the name of this mod suggests, the SnowWolf X Feng High-Class Version 230W is the epitome of vaping luxury. From its sophisticated, high-end look to its ability to live up to high expectations performance-wise, this vape mod is one that’s sure to please even the pickiest vaper. The chipset comes packed with a slew of customizable settings, as well as an excellent temperature control suite and several protective features. 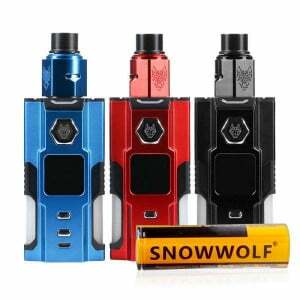 Because it utilizes two 18650 batteries, the SnowWolf X Feng High-Class 230W can stand up to all day vapes, and recharging is incredibly quick and simple. True to the brand’s trademark style, this mod has the look of a futuristic, military-esque device with sturdy construction, bold styling, and minimalistic color options. With literally thousands of options for e-liquids, it can be tough to know which ones to choose - especially if you’re searching for a gift. For premium e-juice that will satisfy even the most serious flavor snob, try a few of the high-end options below. The GRND RSRV Catch Ya Latte blend is one of VaporFi’s top-rated e-liquids, drawing inspiration from artisanal coffee house flavors like rich espresso, sweet caramel, creamy steamed milk, and hazelnut. Bottled in a premium bottle and stylish packaging, this vape juice will make an impression right away - one that it will certainly live up to flavor-wise. Catch Ya Latte is an excellent balance of sweetness and depth of flavor, and has earned a serious fan base of coffee lovers and sweet tooth vapers alike. You can’t go wrong with the classic flavor of tobacco, especially if you’re shopping for a vaping traditionalist. Our Cuban Cigar Vape Juice takes the intense flavor of tobacco and kicks it up a notch, perfectly capturing the luxurious experience of enjoying an expensive Cuban-made cigar. This e-juice is a great option for the vaper who enjoys a relaxing vape session, and its exotic flavor and rich aroma feel like an express ticket to a tropical paradise. Customize this blend to fit your vaper’s tastes, including adjusting flavor strength, nicotine level, and VG/PG ratio. Another e-juice from our hugely popular GRND RSRV collection, Maui Menthol is a tasty spin on the timeless minty-fresh flavor. The collector’s edition packaging hints at the luxurious flavor experience within, combining unique flavors like papaya, jackfruit, guava, honeydew, and menthol. The balance of refreshing menthol and sweet Hawaiian fruit creates a vape experience unlike any other, becoming a fast favorite for fans of menthol and fruity juices alike. Like all VaporFi e-liquids, GRND RSRV Maui Menthol is made with the highest-quality ingredients in our FDA-certified labs. To really impress the vaper in your life, gift them with a pairing of top VaporFi e-juices in the VaporFi Decadent Delight Vape Juice Bundle. They’ll score 120ML of premium e-liquid, split between the top-selling flavors of Bites Vanilla Caramel Swirl and Raspberry Mocha. Perfect for a morning vape session, Raspberry Mocha is a decadent combination of espresso, dark chocolate, and sweet raspberries. Bites Vanilla Caramel Swirl is a guilt-free way to satisfy even the stubbornest sweet tooth, hitting all the right notes as a dessert-inspired blend of vanilla ice cream, Bavarian cream, and rich caramel. For a gift that’s sure to wow any vaper, put together a VaporFi sampler pack with your choice of three premium blends. It’s a great option for the newbie vaper or one who enjoys experimenting with new flavors, because it’s an easy, fun way to try new e-juices without making the commitment of a giant-sized bottle. Our sampler pack offers a virtually endless list of options, so you can get as creative as you want. Choose from flavor classics like menthol, tobacco, and coffee or get a little more adventurous and try one of the new dessert-inspired blends. Whichever combination of e-liquids you choose, you’ll be giving the gift of a thoughtful, completely personalized present. Sub-ohm vaping has become the vape style of choice for many experienced vapers, with many of the industry’s top brands crafting specially-designed tanks to perfect the sub-ohm experience. Uwell’s Crown series is a legendary collection of premium vape tanks, with each one earning major respect from the vaping community as a whole. The Crown 4 is the most recent debut, continuing the Uwell tradition of raising the bar on quality and performance. It utilizes a brand-new series of coils designed to make the most of the Crown 4’s potential, crafted from premium high-grade 904 series stainless steel and FeCrAl. The coils are designed with an innovative structure that minimizes leaking and spitback, keeping the vapor perfectly warm and consistently flavorful. Serious cloud chasers rejoiced with the release of the VOOPOO UFORCE Sub Ohm Tank, which is specifically designed using an innovative venting system to maximize vapor production. A thoughtful combination of triple airflow slots and a speedy vent channel result in impressively voluminous vapor clouds, all while eliminating the too-common issue of an overheated tank. VOOPOO engineers knocked it out of the park by reducing the path from intake to wattage, a design detail that unlocks increased levels of vapor production as well as mind-blowing flavor. Plus, 3.5mL of vape juice capacity add an element of convenience to this high-performing tank, making it a smart, high-quality investment. Most vapers would agree that a premium tanks list would be incomplete without an appearance by SMOK, one of the best-known brands in the business. The TFV12 Prince Sub Ohm Vape Tank provides an elite vaping experience and plenty of room for customization, with 7 different drip tip colorways and a choice between a standard 5ML tank or extended 8ML glass addition. The TFV12 Prince holds the potential for 120 watts of maximum output, which may come as a surprise considering its impressively compact footprint. The Horizon Falcon is a high-end sub ohm tank that combines convenience with performance, appealing to a wide variety of vape styles and preferences. It has a generous 5ML e-liquid capacity, with thoughtful design elements like a threaded top-filling tank and POM drip tip. The Falcon offers serious performance potential thanks to Horizon’s innovative coil designs, with four unique options included with the tank (the F1, F2, F3, and M1 coils). Each coil design utilizes a specialized balance of materials to achieve specific performance goals, with laser-focus on both flavor and vapor production. The Aspire Nautilus Sub Ohm Tank has been a fixture in the vaping community for quite some time, and for good reason. When it was first debuted, it led the industry towards a new way of thinking about coil design, bringing new levels of performance and innovation to vaping as a whole. Even though the Nautilus has spent some time on the market, it’s never wavered from being one of the top choices for vapers with high performance expectations. The Aspire Nautilus is able to provide an incomparable mouth-to-lung (MTL) vape, as well as desirable benefits like generous e-liquid capacity and an adjustable airflow system that can regulate e-juice flow into the coil. Looking for an RDA to suit your favorite DIY-savvy vaper? These five options go above and beyond the call of duty from the rebuilding process to the final vape experience. If you’re shopping for a dripping aficionado, odds are they’ll recognize the name Tony B. - and be pretty thrilled to own an RDA crafted by him. Created in a collaborative effort between Vandy Vape and Tony B., the Pulse 24 BF RDA is precision-engineered to provide the ultimate in quality and innovation. It has a dual build that’s able to create massive, voluminous clouds with intense flavor. Specially designed for dripping/squonking, this bottom-fed RDA is a postless deck that makes it easy to mount additional builds for maximum creativity and includes smart features like a slanted jet funnel top airflow (completely adjustable) and a generous 7mm juice well. Ideal for extended-use dripping, the Recoil Rebel RDA by Grimm Green x OhmBoy OC has an impressive build deck that offers plenty of space. Sizeable builds will have no problem fitting into the 25mm diameter space, opening the door for giant fluffy clouds packed with pure flavor. A major highlight of the Recoil Rebel’s design is the ability to select one of two separate barrels, one designed for maximum flavor and the other for increased vapor production. For the truly serious flavor connoisseurs, this RDA has a snakebite airflow cap that cranks flavor up even more. Finally, an ultem ring makes it possible to turn the dripper into a generously deep, leak-free reservoir for the ultimate in versatility. Birthed through a joint effort by Wotofo and Mr. JustRight1, the Profile 24mm RDA maximizes flavor potential while setting the stage for an enjoyably effortless build. This RDA is an excellent choice for the vaper who values flavor above all, incorporating a wick lifting system and optimized airflow that make the most of their favorite e-juice. When the Profile 24mm RDA was created, the goal was to eliminate the problems that often come up for mesh builders working with more traditional deck designs. It’s spacious and comes with wide-clamp ceramic support and extra-wide terminals, as well as a gold-plated 510 connection and detachable structure. If you count yourself as a member of the vape community, you may have heard of the original Goon RDA design. The Goon V1.5 by 528 Custom Vapes makes improvements on its impressive predecessor, earning attention for its hassle-free design and high-performance potential. It’s created to satisfy cloud chasers and flavor fans alike, pairing well with high-VG liquids and excelling at high wattages. The 7mm juice well comes in handy, as does its 12mm x 3mm air slots, clear glass tank, and top airflow design. The Dead Rabbit RDA is a uniquely-named collaboration by Hellvape and Heathen, taking their combined vape genius to produce a vape experience that’s truly next level. It’s a versatile RDA that works well for serious RDA vets and casual vapers alike, handling large builds and varying coil options with grace. For direct-to-lung (DTL) vapers in particular, the Dead Rabbit RDA exceeds expectations, working equally well for dripping and squonking. Want to put together a personalized present that really shows you care? Give the gift of a custom vaping experience to fit their vape style. What could be a better vape gift than designing a customized e-juice that perfectly fits their unique palate? VaporFi’s DIY Vape Juice tool has a near endless realm of possibilities, with nearly 30,000 potential combinations. You can choose anywhere from one to three flavors to combine, then customize the flavor strength, nicotine level, and VG/PG ratio. It’s a fun way to get creative with your vape gift, creating something with a thoughtful personal touch. Plus, with VaporFi’s trademark high standards, you can be confident that the blend you design will have unparalleled flavor, premium ingredients, and incomparable quality. The VaporFi VOX 80 TC Starter Kit Bundle is a vape gift that has serious wow factor, setting your favorite vaper up with everything they need for a perfect vape session. The VOX 80 TC has a powerful 4000mAh built-in battery and supports both temperature control and variable wattage atomizers, offering excellent power and performance in a sleek and stylish package. With this bundle, you’ll be able to customize everything, including the tank model, device color, and case color. Then, you’ll round out the bundle with the e-liquid of your choice, with the convenient option to customize VG/PG ratio, flavor blend, and nicotine level. Have a menthol lover in your life? We carry several menthol vape juice bundles, so you can choose a delicious combination of icy, refreshing flavors, with one of our top-selling options being the VaporFi Menthol Lovers Vape Juice Bundle. This combination of three menthol-centric flavors includes a total of 180mL of juice: GRND RSRV Island Frost (mint, coconut, pineapple, blueberries, and lime), GRND RSRV Maui Menthol (menthol, papaya, jackfruit, guava, and honeydew), and Very Berry Ice (blueberries, raspberries, watermelon, and fresh colada). One of the most popular e-liquid options on VaporFi is our three-flavor bundle, which lets you choose three different flavors for a sampler-style gift. Tobacco is one of the most popular juice flavors around, and we have no shortage of options for creating a customized tobacco flavor bundle. Choose from a wide variety of tobacco-focused juices, from timeless classics like Classic Tobacco and Sahara Gold to more adventurous flavor blends like Tobaccolicious (tobacco, vanilla, and caramel) and Totally Toffee Tobacco (smooth American red tobacco and sweet toffee). Berry-Flavored E-Juice Bundle Another way to get creative with our three-flavor bundle is to design an all-berry trio, putting together a collection of perfectly ripe delights any fruit enthusiast would love. We have berry-focused flavors that run the gamut from refreshing and light (like Straw-Nana Smoothie and Berry Limeade) to sweet and decadent (like Blueberry Waffle Overload and Maple Berry Donut). Put together a trio of berry-inspired juices that can be enjoyed morning, noon, and night, keeping every vape session fresh and delicious. Vape accessories are a great gift for the vaper who has everything, especially when you choose something with tech-savvy innovation and long-lasting design. A good charger is a must for every vaper, and this four-bay universal charger by Nitecore streamlines the charging process from start to finish. It works safely with a range of battery types, charging efficiently while protecting batteries from dangerous overcharging. Features like its portable design and smart LED battery life indicator makes recharging easy anytime, anywhere. Replacement coils are another necessity of vaping, but buying high-quality versions makes all the difference when it comes to a quality experience. These FreeMax Mesh Pro Tank Replacement Coils are designed for the tank of the same name, maximizing on flavor and delivering a thoroughly satisfying vape. This pack includes a single, double, and triple mesh Kanthal coil for a range of options to fit specific vape needs. The perfect complement to the Geekvape Areo Sub Ohm Tank Atomizer and the Geekvape Shield Tank, the Aero Mesh Tank Coils are designed to increase surface area for serious cloud production. With Kanthal wires and 100 percent organic cotton, this 5-pack of GeekVape coils is the ultimate in premium quality and performance. For the vaper who uses VooPoo’s Uforce Tank, the Uforce Mesh Replacement Coils are a must. Having a good back stock on hand is smart, especially to avoid running out of coils at the wrong moment. This assortment of four coil types utilizes a high-quality mesh design for intense flavor, offering a variety of resistance options to match with different power ranges. Giving the gift of a new tank is like opening the door to a new vape experience, especially when you choose a top-notch option like the Aspire Cleito 120 Maxi-Watt Sub-Ohm Tank. This premium tank design has risen to the top of the ranks for both flavor and vapor quality, thanks to a smooth airflow design, excellent wicking capabilities, and a smart coil design that eliminates the need for a chimney. Rounding out our ultimate gift guide is this collection of top-quality vaporizers, offering excellent gift options at every price point. Looking to give the gift of a great vape experience without dropping major cash? The VaporFi VAIO Mini Vape Starter Kit is an incredibly affordable gift option that won’t disappoint in terms of performance, proving that sometimes, good things really do come in small packages. It’s a great mouth-to-lung (MTL) device that offers benefits like fast charging, a built-in tank design, and pocket-friendly size, fueled by a powerful 1000mAh battery and high-performing atomizers. As dry herb vaping grows in popularity, we’ve created a few excellent options for quality, well-constructed dry herb vaporizers. The VaporFi Orbit Dry Herb Vaporizer Kit is among out top-rated products in the dry herb category, designed to withstand extended, high-volume use without sacrificing on performance quality. The advanced heating chamber is simple to refill, while the device as a whole is crafted to be easy to use and maintain. Slim, compact, and impressively discreet, the VaporFi Atom Dry Herb Vaporizer is an excellent choice for using anytime, anywhere. It comes with three different temperature control settings and an easy-to-see temperature indicator, so it’s simple to choose and lock in the desired temperature level. Innovative motion-sensing technology makes it possible to check battery life by giving the device a gentle shake, combined with a useful life-preservation mode that saves battery life when the vaporizer is not in use. Ready to go down in history as the best gift giver of all time? The title will be well-deserved when you give the gift of a custom-designed vaporizer. Whether you want to help your loved one make the switch from cigarettes or you just know they’re in need of a vape upgrade, the custom-build tool makes it incredibly easy to design a personalized device they’ll absolutely love. Choose the device style you want (pen or mod), then pair it with the perfect tank and accessories. It is a quick and simple process with plenty of options, resulting in the ultimate wow-worthy vape set-up. When you’re in search of the perfect vape gift, there are plenty of online retailers to choose from - but not all are created equally. VaporFi has earned a spot as a respected industry leader, and for good reason. Our mission has always been to combine premium-quality products with highly-competitive pricing and unbeatable customer service, because we believe that our customers deserve the very best. Just like our customers, many members of the VaporFi team are passionate about vaping, and we’re proud to serve as a trusted source of quality vape products. Forget cheaply-made knock offs and money-wasting clones; at VaporFi, you can confidently browse a selection of authentic products from the brands you know and love. Plus, with money-saving benefits like our loyalty program, everyday free shipping, and more, you can hang on to more of your hard-earned money. Whether you’re shopping for yourself or want to share the vape wealth with a friend or family member, stick with VaporFi for the best vape shopping experience in the business. Looking for more gift ideas or want to learn more about vaping? Check out the VaporFi blog and Learning Center, or browse our comprehensive Guide to Vaping. Or, contact the friendly VaporFi support team for answers to all your product and vaping questions.